Andrew Byers is deeply concerned for the Christian cynic. 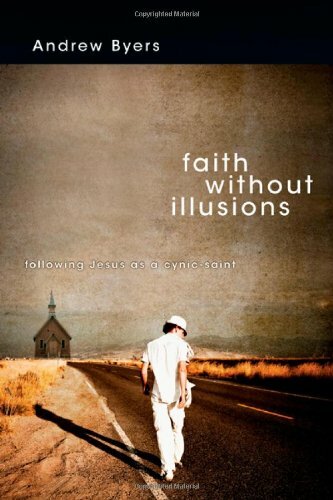 In Faith Without Illusions: Following Jesus as a Cynic-Saint (IVP), Byers admits to falling in and out of cynicism himself. He knows that it is a sickness that must be checked before it poisons the soul. Christian cynics become cynical, he says, because they have become disillusioned. While most see disillusionment as negative, Byers does a wonderful job explaining that disillusionment is "the dispersal of illusions" and can actually be a form of illumination. Those struggling with cynicism may feel convicted but never condemned as Byers lifts a prophetic voice to critique Christian cynics. The key is that the critique comes off as edifying: it shows cynics how to use their gifts of disillusionment and insight to better the church that left them feeling jaded in the first place. The book is separated into two parts. The first addresses various illnesses rampant in the church that drive Christians to become cynical in the first place. While the list could be much longer, Byers focuses on Idealism, Religiosity, Experientialism, Anti-Intellectualism, and Cultural Irrelevance. These chapters are by far the easiest to relate to; most Christians—or at least most American Christians—can readily identify these illnesses as being endemic in either their present church or a church they have attended in the past. Byers sprinkles each chapter with anecdotes from his life and fills the book with both humor and humility. It would be easy to side with the cynics, merely railing against churches that display these illnesses. Instead, Byers has sympathy for the churches bedeviled by these pathologies—and he contends that the reader should as well.